Harry S. Truman, 1884–1972. 33rd President of the United States. First edition, first printing hardcover copy of Mr. President, inscribed and signed, Harry S. Truman. This is an uncommon book because it is inscribed and signed to a relative. 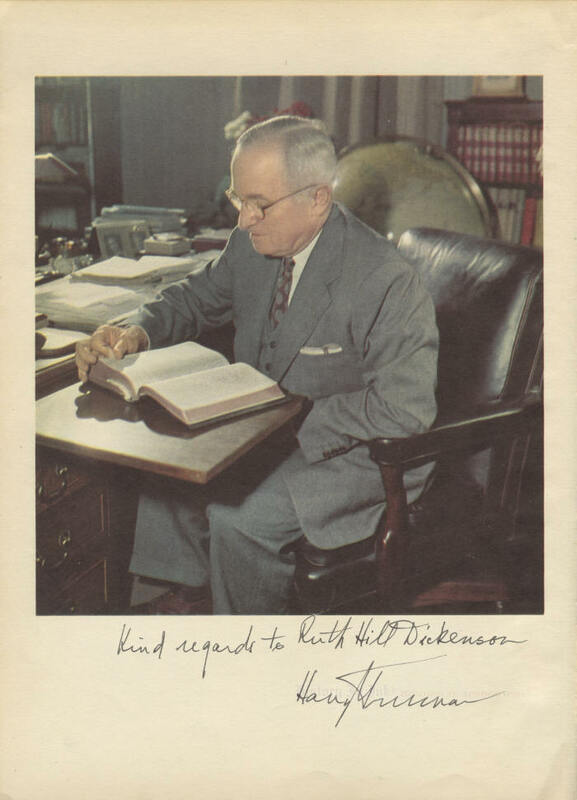 Truman has written on an inside page beneath a photograph of him at his desk reading what appears to be the Bible: “Kind regards to Ruth Hill Dickenson / Harry S. Truman." Mr. President is extraordinary because Truman gave author William Hillman, a veteran newspaper correspondent, unprecedented access to his personal diaries, letters, and notes while he was still in office. “I want the people to know the Presidency as I have experienced it and I want them to know me as I am,” Truman told Hillman. “I expect there will be those who will construe this as a political act. You and I know better." Hillman interviewed Truman and included information from the interviews, along with excerpts from Truman's private papers, in this book. The book was published in 1952, during the last year of Truman's presidency. Truman's extraordinary character comes through in the writings in this book. Appreciated today for his honesty and his blunt, direct style, Truman was much deeper than the “give 'em Hell" politician that some portrayed him to be. He had a thorough knowledge and understanding of both American and world history that guided him through the many challenges that he had to face: the dropping of the first atomic bomb, the end of World War II and domestic economic reconversion, the beginnings of the Cold War, the Berlin Airlift, the establishment of NATO, racial integration of the armed forces, the first true civil rights program, the recognition of Israel, the Korean War, and the firing of General Douglas MacArthur. Truman's gutsy and courageous campaign in the face of virtually universal predictions of his defeat in the 1948 presidential election has won him a permanent place in the annals of American politics. The book contains many color and black-and-white photographs of Truman, his family, members of his staff, and other important figures. It refers to Truman as the 32nd President, rather than the 33rd, based on Truman's insistence that Grover Cleveland should not be counted twice, although his two terms were not consecutive, because other presidents who served more than one term are not counted more than once. The autograph is pristine, and overall the book is in very good condition. The text block is clean and tight, and the gilt lettering on the cover is still bright. The book shows some shelf wear, however. The denim blue boards are a bit faded, and the grey-beige spine is soiled, although the black title block and gilt lettering are still strong. The corners and bottom edges of the boards are bumped and worn, and the back free flyleaf and back pastedown are are toned. The dust jacket has some repaired tears and paper loss. Altogether, this is a desirable copy, all the more so because of Trumanʼs inscription to a relative. It would make a nice addition to any Truman or presidential collection. Click here to see more Truman and other items on the Presidents page.